After 1894, Council Housing was provided by Wokingham Rural District Council, but many Parishes had their own stock of houses which were gradually closed down, usually after being condemned for being 'unfit for human habitation'. We have quite a lot of information on Arborfield's Parish Cottages, but only one photograph. 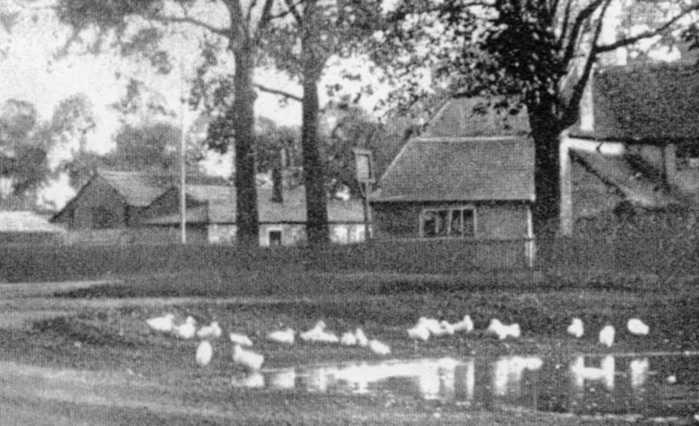 The Cottages in Swallowfield Road faced the Bull public house, shown here from across the old village pond. Arborfield Parish had six cottages to rent, while Newland had none; on the other hand, the Newlands Estate had many cottages for its workers (see the Newlands Estate Sale document for 1947). "To Captain Stuart Rickman, R.N, and Overseers of the Parish of Arborfield. I will undertake to take up present brick floors, take out earth to the depth of 6" and fill in with 6" of concrete, repair living rooms with new red paving bricks 4 1/2" x 9", and relay pantry floors with the old paving bricks. Take up old wood floor of back bedroom in Mrs. Hayward's cottage, make good joists, and relay new floor and fix new skirting to do., and repair holes in other wood floors, provide and fix one 30" kitchen with oven only. Clean and whiten ceiling and color (sic) walls of interior of Cottages, and paint wood work of do. 3 coats. Take off the whole of slates on back side of cottages where not laid close, make good battening and relay with close slating, and reset ridge and back hip tiles, and provide and fix 4" half round eaves, guttering to front ends, and back of cottages. Put in brick foundations at back of woodhouse and provide and fix one new door and frames to do., and make good wood work, provide pails and make the necessary alterations to closets. Make good pointing of walls where bad and paint outside painted work and front gates 3 coats in oil for the sum of twenty seven pounds ten shillings. Your Obedient Servant, Geo Garrett." Payment took time, instalments being paid when half-yearly rents were paid: £9/15/- in March 1896 and again in November, and the final £8/-/- by a precept on the Overseers. In November 1898, a meeting was held to consider the question of repairs to the two chimney tops and the re-thatching of the roofs of the four Arborfield Parish cottages near the pillar box - in what was referred to as Lower Arborfield. In 1901, insurance on the six cottages was increased to £75. The annual meeting in 1907 "decided that the tenants of the six parish cottages should be notified that they should in future be weekly tenants and give or receive one week's notice, and that the rent viz. 1/3 per week or 5/5 per Calander Month (sic) be paid monthly, to Mr. A.E.Scrivener, Overseer of the Parish." Various repairs were carried out in later years, usually by the Garrett family. In 1918, it was reported that the tenants in Lower Arborfield had complained of the difficulty in drawing water from the well by means of a bucket and hooked stick, and it was suggested that a pitcher pump be costed. Take off and re-fix the whole of the ridge and hip tiles and repair the slating. Rake out and make good all the defective pointing of the brick-work. Lunn's cottage: - Put an iron casement fitted with a lead light, and repair the fixed lead light of the living room window. Re-tie the lead light to the frame and put a new stay hook to the opening casement of the front bedroom window. Put a new window, about 2'3" x 2' to replace the existing small window in the back bedroom. Inside: - Repair the plastering, clean, stop and distemper the ceilings and wall throughout. Spicer's cottage: - Put an iron casement, with lead light, complete to the window in the living room. Brean's cottage: - Put a new window frame and casement to the Larder. Render the lower part of the walls of the living room, where damp, with waterproofed cement mortar, and re-plaster the upper part of the end wall with hair mortar. Repair the plastering, clean and distemper the ceilings and walls of the cottage throughout. Mrs. New's cottage: - Render the lower part of the end wall of the living-room and of the staircase, where showing damp, with waterproofed cement mortar. Outside the cottages: - Render the walls with waterproofed cement mortar, the east end to a height of about 5' from the ground line, the front about 5' and the west end about 4' up. Put a new door to the W.C. and cover the pit with oak slabs. Repair the thatching of the roof." After these were completed, the WRDC Sanitary Inspector requested that more repairs were needed. The cottages at Greensward Lane were further repaired, by Messrs. A. Barker and Son, in 1938. WRDC paid 2/3 of the cost. Again in 1946, the cottages were re-thatched. By 1956, the Greensward Lane cottages had been supplied with electricity (as had the pre-war Council Houses); the Swallowfield Road cottages were condemned. By 1962, those in Greensward Lane were also condemned.